First tree shrews, now bacteria. It's a symbiosis bonanza! 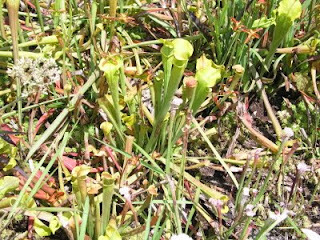 A new paper in Applied and Environmental Microbiology details some very interesting symbioses in the pitchers of Sarracenia. Koopman et al. used environmental DNA sequencing to find bacterial sequences from pitcher fluid. They found 1000 unique bacterial types, which is comparable to the number of bacterial types in the human gut. They also did time-series samples for different plants and found that bacterial content gets progressively more similar over time. It's also significantly different from the bacterial content of the surrounding soil. Very interesting stuff. I'd love to see more sequencing to see what kind of metabolism these bacteria are capable of. Leave it to Science Daily to illustrate their news article on Sarracenia pitchers with a photo of Nepenthes. That's Sarracenia alata above. I don't usually like to talk about my research plans for the future. It's not that I don't plan. I constantly make lists of research that I think needs to be done. The problem is that I only vaguely keep to those lists. What I perceive as priorities change along with the circumstances, even though my overarching goals remain constant. In a sense, I think sharing my research plans with the general public obligates me to actually carry through with a project that I might decide later is not so important. Remember that series on design I started a while back? I was kind of distracted by some other interesting results and by some silly accusations. After my confession of ambivalence about Meyer's Signature in the Cell, one "helpful" fellow suggested that I was too dismissive. After all, even in my understanding of creation, I still need a way to identify design. I used to think like that, but now I see that design is a far more difficult problem than encapsulated by the dichotomy of "designed" vs. "not designed." I think there are far more fruitful approaches to the study of design. Are Nepenthes tree shrew toilets? demonstrated that at least three pitcher plant species in the highlands of Borneo do not feed primarily on insects. Instead, they obtain their nutrients from faeces deposited in their pitchers by tree shrews feeding on nectar exuded by glands on the inner surfaces of the pitcher lids (Chin et al 2010).I won't steal Paul's thunder on this one. You should read his report for yourself. 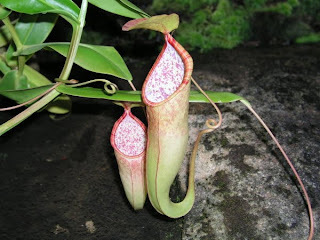 I would just like to add that Nepenthes pitchers totally look like toilets. Case closed. BSG members: There's a new BSG newsletter posted at the BSG website. After you log in to the BSG site, you'll see "Newsletter" appear in the links at the top of the page. I want to thank Jonathan Bartlett for editing these newsletters for us. I know what a hassle it can be putting these things together, especially for such a small group, and I appreciate his work on this. ABSTRACTS ARE DUE APRIL 2, 2010! 2010 BSG/CGS Joint ConferenceThe summer conference of the BSG and the Creation Geology Society will be held at Truett-McConnell College in Cleveland, Georgia on July 28-30, 2010. Please consider submitting an abstract for the summer conference. See call for abstracts below. A devastating illness is sweeping through Tasmanian devil populations, slowly moving westward across Tasmania. It's called Devil Facial Tumor Disease (DFTD), and it's a kind of cancer. The strange part is that the disease is transmitted by transferring tumor cells to uninfected devils through biting. The tumor cells begin growing into tumors and eventually kill the new host. This disease could very well drive the Tasmanian devil to extinction. Poor devils. One would think that the immune system would reject these foreign tumor cells at least in some devils, much like organ transplants of the wrong tissue type are rejected. New research from Siddle et al. sheds light on this possibility. While attending an SMBE conference a few years ago, someone asked me where I was from. When I said Tennessee, she smirked and said, "Do they still let you teach evolution there?" Ha ha ha. I just brushed it off. "For now," I said with a smile. I guess the negative stereotype inspired by press coverage of the Scopes trial and the pseudohistory of Inherit the Wind is still alive and well. But how fair is that stereotype? The latest issue of Reports of the NCSE has an article on teaching evolution in the anthropology classes at UTK. It's written by Kramer et al., two profs at UTK and one at Texas Tech. They surveyed 1079 students in their anthropology classes for a decade. Their results were mildly surprising, and their methodology was a little peculiar. At least one of their conclusions was downright strange. A few weeks back, I mentioned a paper published in Laterality that linked degree of handedness with belief in creationism. Thanks to a reader, I now have a copy of that paper. 1. The earth was created in less than seven days. 2. Adam and Eve were the first two human beings. 3. The theory of evolution is well supported. 4. Evidence such as fossils, bones, and certain rock formations support the idea that the earth is at least millions of years old. There are some interesting articles in this week's Nature. First, from the world of fungal genomics, Ma et al. report the genome sequences of two Fusarium species. Not surprisingly, each sequence has regions that are specific to the species it comes from, and those specific regions are also full of transposons. Regarding F. oxysporum, I found it amazing that its pathogenicity appears to be linked to a specific chromosome, which can apparently be transferred between strains. In one experiment, a nonpathogenic F. oxysporum strain that lacks the chromosome gained it by horizontal transfer, rendering the strain capable of infecting a host (in this case, tomato). Here I thought that kind of pathogenic gene transfer was a bacterial trick. Ma et al. 2010. Comparative genomics reveals mobile pathogenicity chromosomes in Fusarium. Nature 464:367-373. I wound up my speaking in England yesterday at Elsenham. My talk was part of the 900th anniversary celebration of St. Mary's of Elsenham. There were about 50 people in the crowd. After the disagreements at Cambridge, I rewrote a significant portion of my "Science and the Supernatural" presentation, and I think it was much better. The crowd certainly reacted positively. There were many interesting questions ranging from the age of the earth to Kantian philosophy to the anthropic principle. Thanks to you folks in Cambridge for helping me refine my thinking on the subject. And thanks to Paul Garner and Biblical Creation Ministries for sponsoring my visit. I'd like to say a special thank you to Stephen and Joan Bazlinton for sharing their home with me during my visit and for arranging my schedule. Hopefully we can do this again sometime. I'm a creationist, of course. You're probably thinking, AH HA! He's finally going to come clean as an evolutionist! Not really. I've actually been pondering labels and definitions thanks to an interesting paper by Richard Peters titled "Theodicic Creationism: Its Membership and Motivations." In this remarkable paper, Peters tries to identify a unifying theme for what he initially calls "radical creationists:"
Radical creationists are radical in that they strive to reinterpret all of the data of of natural history to show that it is compatible with their religion. These are the creationists who are sometimes called anti-evolutionists, young Earthers, Flood geologists, and biblical creationists - none of which are very apt titles. My presentation on "The Challenge of Darwin" in Coventry was rather uneventful, but the presentation in Cambridge on "Science and the Supernatural" sparked a spirited discussion led off by a gentleman who deeply disagreed with what I said. Despite a few delays, I managed to arrive safely in Manchester this afternoon. 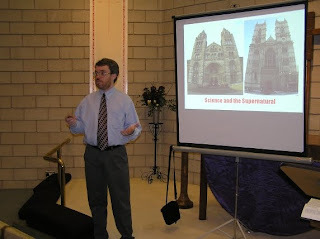 My first event of the week was speaking on "Science and the Supernatural" at Elmwood Church in Salford. My basic point was that science deals with the supernatural readily and therefore utilizing the supernatural in explanation should not by itself disqualify that explanation as science. I gave as examples prayer studies, Shroud of Turin studies, and scientific refutations of creationist claims. The crowd reacted quite well to the presentation (though I ran a bit long), and I got a number of really insightful questions. Many thanks to Duncan Bottrill for organizing my visit. Tomorrow I'm headed back to the London area to prepare for my more technical presentation "The Challenge of Darwin" on Saturday. Now, I'm exhausted and I'm going to sleep. Other creationists do research, too! I was reading the CRS board of directors' minutes in the latest issue of the Quarterly, and I was a little shocked by one of the statements. According to the minutes, CRS president Don DeYoung "shared that we are the oldest creation organization and the only one doing research." I thought that it must be a typo or some kind of oversimplification of what he said, but then under the CRS research committee report, I read, "The CRS is the organization actually doing research." I understand that the Board wants to promote the CRS, and I understand the need to make an organization distinct. I also understand that the CRS is one of the few creationists organizations that has a primary mission to encourage and publish original research. But that doesn't make the CRS the only ones doing research. I'm sure this was just a mistake in the minutes, but for the sake of the public, I'd like to clarify the issue. For years, Joe Francis has argued that creationists really need to get on the ball with symbiosis studies. Theologically, mutualistic symbioses are very consistent with the nature of God. God values fellowship and community, and He Himself is a Trinity of persons. Mutualistic or commensal symbioses are extremely common, arguably more common than pathological interactions. The relative rarity of pathology over mutualism suggests a mechanism to account for some pathology: it's mutualism gone wrong. It also suggests that the normal condition is mutual cooperation not a struggle for existence. As an example of the importance of symbiosis, consider the bacteria that live in your gut. Yes, in case you didn't know, bacteria live in your intestines. They help digest food, and studies even suggest that some bacteria may be essential for proper development. In other words, without those bacteria, you couldn't be you. You might recall my lament over Ida and hype-driven science. Described in a PLoS ONE paper by Franzen et al., Ida is an Eocene primate fossil, stunningly preserved, and the subject of a media blitz last summer. Ironically, it's a blitz that few people really bought into. I could sort of understand this level of excitement if we just put a man on Mars or cured cancer. But it's a monkey. Yes, it's a neat monkey, and it's unusual, and it's really, really beautifully preserved. But it's a monkey. It's supposed to help us understand which group of primates the great apes evolved from, but even that is already contentious.The irony is that even at that time, few people even in the gullible media bought the hype. Instead, they went to scientists who were skeptical of the find for commentary. The publicity sort of backfired, but I guess since everybody knows about Ida, it worked after all. In my quest for all things weird, I was absolutely delighted to stumble across a reference to the International Flat Earth Society on John Lynch's blog. Unflattering comparison of creationists to flat-earthers has been around for years, and numerous creationists have attempted to track down the legend of the "Flat Earth Society." Finally, an article by Jerry Bergman published in Journal of Creation in 2008 reported the almost unbelievable story of the Flat Earth Society [PDF]. It did exist, and it had a newsletter! Needless to say, I wanted that newsletter for the CORE library. Now I learn that the Flat Earth Society is apparently still going, and you can download their newsletters from their website. You can even sign up for a flat earth T-shirt. Fantastically bizarre. I just flipped through the latest Acts & Facts (March 2010). Let's go over some basics on transposable elements and their relationship to the argument for evolution, specifically the common ancestry of humans and chimpanzees. McClintock, B. 1950. The origin and behavior of mutable loci in maize. PNAS 36:344-355. Today we know that transposable elements are stretches of DNA with the ability to copy and move (transpose) to new locations in a genome. This can happen in a single cell quite apart from the usual duplication of DNA (replication) that occurs each time the cell divides. As a result of transposition, transposable elements can increase in number in a single cell. When transposition happens in germ line cells, new transposable elements can be passed to offspring. This post doesn't have much to do with origins, but I just read an astonishing book, and I want to tell you about it. The book is The Immortal Life of Henrietta Lacks by Rebecca Skloot. If you don't recognize the name Henrietta Lacks, perhaps you know her cells: HeLa. They made the modern medical revolution possible. Everything from polio vaccine to cancer treatments to the human genome project traces back one way or another to HeLa. Did you ever get a vaccine? Know a cancer survivor? Then you've probably benefited from HeLa-derived therapies. I figured that last post on design would generate some disagreement. Let's face it, it's pretty radical for a creationist to suggest openly that the Enlightenment and scientific revolution went wrong from the beginning. On the other hand, I had no idea people would actually go bananas over it. Over the weekend, I ended up on the front page of Panda's ThumbandUncommon Descent, and my blog stats went up an order of magnitude. Frankly, I'm flattered. I had no idea you cared! Now if this were any other blog, I'd be spitting nails trying to defend myself against all sorts of accusations from both sides, and I suppose some of you might be reading this just to see what I have to say for myself. Well, sorry to disappoint, but I don't feel much of a need to defend myself against the silly things people have been saying. I think that my blog and - more importantly - my work speak for themselves.